Mid-term elections loom large as Congress vacations. Neither party appears to have a plan to restore middle class jobs. New-vehicle retail sales in the last week of August slowed considerably, pulling down the August selling rate below 8.5 million units, according to the latest data from J.D. Power and Associates. For total sales, the seasonally adjusted annualized rate (SAAR) is expected to come in below 11.4 million units, with fleet sales offsetting some of the weakness in retail sales. This is far below the 16-17 million unit years the industry thrived on earlier in the decade, and the latest indicator – among many – that the U.S. economy is in trouble. The final sales numbers, which will be out tomorrow as auto makers report shipments, increase the pressure on the incumbent Obama Administration to do something about the ongoing Great Recession and staggering levels of unemployment in the stalled U.S. economy. While Republicans remain critical over deficit spending, the party that presided over the reckless practices of Wall Street that led to the current economic collapse are offering no ideas on how to get what was once $13 trillion in U.S. gross domestic production back on track, as businesses continue to cost cut, not invest, and consumers stay home. Lexus and Scholastic launch fourth annual environmental contest with $500,000 in grants and scholarships to be awarded. With the majority of kids about to head back to school, Lexus is again issuing an environmental challenge to win thousands of dollars in grants and scholarships. The fourth annual Lexus Eco Challenge calls on students to identify an environmental issue, develop an action plan to address the issue, implement the plan, and report the results. Groups of 5-10 students, with the help of a teacher advisor, can compete in two categories: Land/Water and Air/Climate. Sixteen teams – eight from high schools and eight from middle schools – will be chosen as winners in each category. Those teams will have the opportunity compete in the Final Challenge, with eight winning grants of $15,000 and two grand prize winners taking home $30,000. Lexus partners with Scholastic, the global children’s publishing company, to run the contest. Shuttles lead to 2011 sales in the world’s largest auto market. General Motors Company marked the arrival of the first drivable Chevrolet Volt models in China today as two of the electric vehicles appeared at the Shanghai Expo Bureau for use as part of its VIP transportation fleet at World Expo 2010 Shanghai. China will be one of the first markets outside the U.S. where the Volt will be on sale next year. 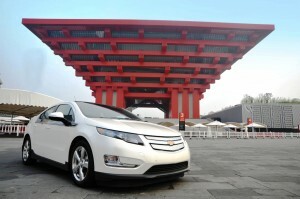 GM is sending the Volt to China before Europe. The Volts will shuttle guests to and from Shanghai’s Expo Park and demonstrate what GM is calling its “vision of sustainable urban transportation.” China of course is heavily dependent on coal-powered electric utilities and along with the U.S. is a leading producer of greenhouse gas emissions. The Volt is the only electric vehicle that can operate under a range of climates and driving conditions with little concern of being stranded by a depleted battery since it carries its own 1.4-liter gasoline engine on board to charge the batteries. Founder Frank Stronach and family prevail in stock swap. The plan, which as already been approved by Magna’s shareholders, unjustifiably enriched Frank Stronach, Magna’s founder, according to the dissidents, who waged a vigorous campaign to block the transaction. The dissident shareholders included the Canada Pension Plan Investment Board, Ontario Teachers’ Pension Plan, OMERS, the Alberta Investment Management Corp. and British Columbia Investment Management Corp. Dissidents also argued that Justice Wilton-Siegel placed too much emphasis on a shareholder vote and the rise in the company’s shares after the plan was announced. Cadillac fixes the proportions of Lexus RX-fighting crossover. Most everyone can agree that styling is critical for new vehicle’s sales. But beyond styling, even the basic shape of the vehicle is important. 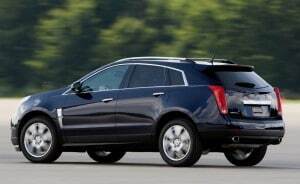 Consider the first-generation Cadillac SRX. While many in the motoring press gave it fantastic reviews, buyers were left cold. General Motors thinks it knows why. The first-generation vehicle was too low, too long. In other words, it was a station wagon and Americans’ dislike for station wagons is well known. For the second generation SRX, GM corrected those issues. The new vehicle is shorter in length, but taller. The third row is jettisoned in the process. Of course, the SRX is dressed in the latest iteration of GM’s knife-edge Art and Science design style. One really cool detail: A character line that starts on the side of the front bumper is continued through the doors after it skips the front wheel well. Many more changes accompany the new crossover. Gone is the rear-wheel drive platform, replaced with front-wheel drive. All-wheel drive, as before, is an option. A pair of new engines replace horsepower 3.6-liter V-6 and the 4.6-liter Northstar V-8. Half-dozen or more models under consideration for U.S. The Alfa-Romeo Giulia, shown in concept form at the 2010 Geneva Motor Show, will help re-launch the brand in the U.S. While the spotlight is focusing on the re-launch of the Fiat brand, late this year, another long-absent Italian marque is getting ready to make its own American comeback. Hundreds of potential dealers were in suburban Detroit, this week, meeting at Chrysler headquarters to discuss plans to roll out the U.S. version of the Fiat 500 microcar, the first of several models Chrysler’s Italian affiliate intends to bring to market. But at the meeting, sources report, Fiat also provided a road map for the re-introduction of its more upscale Alfa-Romeo brand. 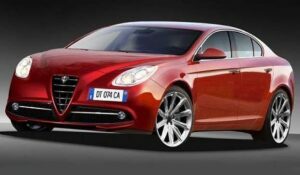 As many as a half-dozen different sedans, coupes and crossovers are under consideration and could make it to market in the years immediately after Alfa’s return, in 2012. That’s on top of the various Alfa products that could be used as platforms for Chrysler-branded models. A revival of the Dodge Viper sports car, for example, is expected to be based on an Alfa offering. Maker claims “local” jobs will jump to 10,000 including suppliers. 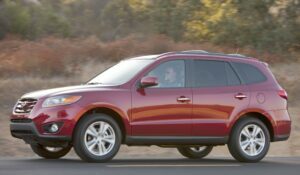 Kia will add a second shift at its West Point, Ga., plant to build the Hyundai Santa Fe, opening up more capacity for Hyundai to build the Sonata at is plant in Montgomery, Ala.
Kia Motors Manufacturing has confirmed rumors it will add production of a second model at its recently opened assembly plant, in West Point, Ga.
Limited production of the Santa Fe, sold by sibling Korean carmaker Hyundai, will begin on Sept. 27. The following month, Kia will launch a second shift at the Georgia assembly line. Your Free Auto News Source! Current employment at the plant is about 1,900, and will grow to about 2,500 with the addition of the second shift. Including local suppliers and other support operations, Kia claims total Georgia employment for the plant will reach about 10,000. Feds to Stigmatize Gas Guzzlers with a D Grade? New label might result in sticker shock - for makers. 1. This vehicle can travel about 26 miles on a gallon of gas for combined city and highway driving. 2. This vehicle uses 3.8 gallons of gasoline to travel 100 miles for combined city and highway driving. This is an energy efficiency rate called fuel consumption. Fuel consumption values, unlike MPG, relate directly to the amount of fuel used. 3. This bar depicts the range of combined city and highway fuel economy for all labeled vehicles. The pointer shows where this vehicle is within the range of all vehicles and other vehicles in the same class as the labeled vehicle. 4. www.fueleconomy.gov will continue to provide consumers with a source of in-depth information. The website allows consumers to personalize estimates based on their own driving habits (i.e. annual miles traveled, local fuel cost, etc.). 5. This vehicle can travel about 22 miles on a gallon of gas for city driving. 6. This vehicle can travel about 32 miles on a gallon of gas for highway driving. 7. $1,617 is the estimated annual fuel cost based on a given number of miles and fuel price, which are listed lower on the label (15,000 miles per year and $2.80 per gallon for this example). 8. This bar depicts the range of the combined city and highway carbon dioxide (CO2) tailpipe emission rate for all labeled vehicles. The pointer shows where this vehicle is within the range. 9. This bar depicts the emission rating for vehicle tailpipe emissions that contribute to local and regional air pollution, creating problems such as haze and smog. The pointer shows where this vehicle is within the range. 10. A QR Code can be used by many Smartphones to access a web page, allowing consumers at a dealership to compare vehicles and personalize estimates, based on their own driving habits and fuel costs. 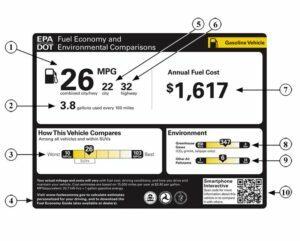 The U.S. Department of Transportation (DOT) and the U.S. Environmental Protection Agency (EPA) are jointly proposing the most radical changes to the fuel economy labels on the window of every new vehicle in dealer showrooms since the regulation began 30 years ago. The stated goal of the new labels is to provide consumers with “simple, straightforward energy and environmental comparisons” across all types of vehicles, including electric vehicles (EV), plug-in hybrid electric vehicles (PHEV), and conventional gasoline-powered vehicles. DOT and EPA said in a joint release this afternoon that they are looking to provide enhanced information on efficiency and environmental performance, including information about air pollutants, such as smog, that impact public health to consumers. The Energy Independence and Security Act of 2007 passed under Republican President Bush specifically calls on EPA and DOT to rate available vehicles according to fuel economy, greenhouse gas emissions and smog forming pollutants. Four hundred dealers invited to submit proposals to sell Fiats. 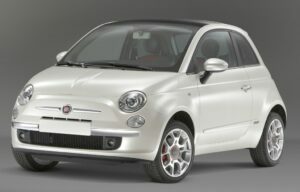 Select dealers will sell the Fiat 500 later this year. Looking to establish 165 Fiat showrooms in the U.S. by the end of the year, Chrysler hosted select Chrysler Group dealers interested in selling the Italian cars at a meeting Monday. Fiat, which controls Chrysler after the U.S. automaker’s 2009 bankruptcy, wants to establish its dealerships in metropolitan areas chosen for their high concentrations of small-car registrations. The dealers were asked to submit proposals for the new franchises by Sept. 22. Chrysler expects to name those chosen for Fiat franchises in the fourth quarter. Declining rate suggests motorists gaining control of finances. Auto loan delinquency rates are falling, even as loan availability rises. U.S. motorists seem to be getting a grip on their household budgets and are doing a better job of getting auto loan payments in on time. The auto delinquency rate took a sharp rise in recent years, a reflection of the worsening economy – and a mirror of the increased mortgage default rate. 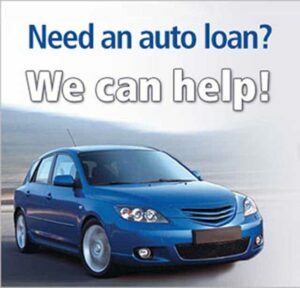 In turn, that led lenders such as the former GMAC, to tighten down on auto loan availability. At one point, in the latter half of 2008, it took a nearly perfect credit score to secure a loan from a General Motors dealer. But industry officials report that lenders are again loosening up, at least a bit, and a declining delinquency rate is one major factor. According to TransUnion, one of the three big credit reporting agencies in the U.S., the late loan payment rate dropped to 0.53% during the second quarter of this year, down from 0.73% during the April – June period in 2009. As is normal, rates varied widely across the country, from a minimal 0.28% in North Dakota to 1.05% in Mississippi. But, significantly, the delinquency rate rose in only three states, Rhode Island, Utah and Montana.